Growing up as what you’d call a cradle Catholic, I lived in an area of the country where Catholic churches demarcated the boundaries within every town. In my hometown, there were three. Sacred Heart on the south-side, St. Thomas on the north-side and St. Valentine’s smack-dab in between. Each boasted a grammar school and your parish (as well as your allegiance) was dictated by your address. Coming of age in that setting, I considered my faith a de facto component of who I was. Just like my mother, grandmother and great-grandmother before me, in the line of my great-uncle the priest and eldest aunt the Sister, I was a Catholic. Catholic, in my estimation, was simply a state of being. 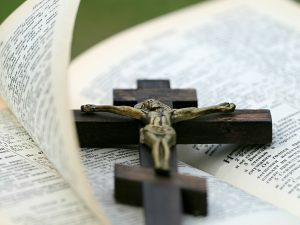 And while my 1st through 8th grade parochial school education instilled me with enough religious education to (mostly) know the 10 commandments, have a loose understanding of the (more popular) doctrines and feel a (mild) motivation to attend Mass on Sundays (at least on occasion), it failed to propel me toward action. Or truly to even recognize the necessity for action. Therefore, I lackadaisically stumbled through young adulthood labeling myself a Catholic whilst routinely shirking the corresponding duties of faith. Then, I grew-up, got married and became a mother. And, as is so often the case, motherhood stirred the dormant embers of faith left smoldering in my heart. My children, like the rest of their Irish-descended kin, would be Catholic so I decided it was time to return to Mass on a more consistent basis. By that time my husband and I had relocated to the Bible-belt, that wonderful southern section of the U.S. where strangers boldly inquire about your current state of salvation and which church you call home. In fact, I like to sum up the northern/southern divide this way: when you meet a stranger up north he’s going to ask what you do for a living, but a southern stranger’s first concern is where you’ll be attending worship services (if you’re not sure, he’ll invite you to his). When asked, I readily identified as Catholic which typically garnered a polite smirk from my inquisitor and a change of topic. Unbeknownst to me at the time, the majority of genuine southerners call themselves Christians; however, in their vernacular Catholic and Christian are not synonymous terms. And so it was as a transplant, that that de facto component of me was put to the test. I began to wonder why it was that my southern counterparts could quote scripture and verse from memory, how it was that they could be so confident of their salvation and why they spoke so boldly about their beliefs. It seemed they weren’t just proclaiming to be Christian, they were actively being followers of Christ. Of course, as is typical of God’s modus operandi, Divine Providence set into motion an orchestra of trials, circumstances, and guides during this same period of awakening such that I could no longer take it on faith that I was a Catholic. That is to say, I was no longer satisfied with a simple label; I needed concrete evidence of my Catholicity. I wanted to understand the whats and whys of this faith of mine. I wanted to be able to give a reply when the next stranger questioned my salvation status. And I needed answers for the sake of my children who would be growing up in a very different world than I had. No sooner had I begun to seek, then the answers appeared. I discovered what seemed like an endless wellspring of Catholic information via the internet, books and programming (EWTN). Indeed, some of the information had been there all along, but now, like the deaf man who encountered the healing hand of Jesus, I began to hear and understand like never before. And the more I learned about the rich history and tradition of this One, Holy, Catholic, Apostolic Church Christ formed, the more I wanted to continue learning. I remember well the very first Ignited By Truth conference that was held in Raleigh. 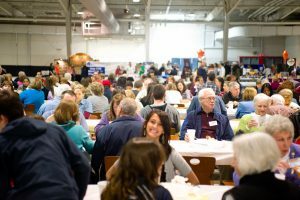 Busy with a growing, young family, my husband and I had never attended a Catholic conference before and we didn’t know what to expect. It was a challenge scheduling babysitters for our clan of tiny people for an entire day, but we knew that we needed this conference so we made the necessary plans. It’s hard to describe the feeling I felt that day, surrounded by so many fellow Catholics. Though I’d spent ample amounts of time throughout the years rubbing elbows with fellow believers, on this day I was in the company of people actively seeking Christ. The energy was palpable. One thing that made a marked impression on me (and still does at every conference) was the fact that God meets us where we are and draws us individually to Himself. Some of the most dynamic speakers come from non-Catholic backgrounds (atheists, Protestants, etc.) Hearing their conversion stories inspires me to dig deeper. Yes, once upon a time I considered myself a Catholic by default. It was part of my identity in the same way that I saw myself as an American or a red-head. Such thinking required minimal reflection on my part and produced equally minimal results in my life. I thought faith was a state of being until I discovered the great treasure that God has given to the world in the Catholic Faith. And from that day on, I was called into an active relationship with the very source of Being Himself, Jesus Christ. I was speaking to my husband about this just last night. I feel like being a Catholic up North is a bit easier because your faith is never questioned, it’s easy to fall into the motions and just go to church and go home. In the South you have to live your faith a bit more. You get called into questioning so you have to do your homework. The best part of having a husband that is not Catholic, but is in the choir and attends Mass regularly is that he calls things into questioning. He wants to learn what everything means and in turn I get to learn it as well or re-learn it. If I don’t know the answer I ask my dad. His being at church as te-ignited that fire in me. I’m glad I’m not the only one that’s struggled with that. I hope to get even more actively involved in my community when I’m done with school. Also, I want to say that the first time I ever felt cool to be Catholic, being that I mostly grew up in the South, was when we got to go to Catholic Heart Work Camp. I realized that other young people like me also loved their faith and wanted to share it. It was so liberating being in a place that is celebrating your faith when usually it’s questioned and debated. Gave me more fuel for my fire.